As I left my house today and went in service with our dispatch I was sent immediately to an injury crash just 1 ½ miles away. As I pulled up I could see it was a rollover crash and had already been told there was one occupant. The vehicle was still resting on its top. The driver was sitting alongside the roadway being helped by a passerby. I could see obvious injuries to her arm as there was blood around the elbow and hand. I asked Bobbi (yes I know her, she is 17 years old and goes to Southeast High School with my daughter and they both play sports together) are you okay. She replied only her arm and hand hurt and other than that she thought she was okay. An off duty Frontenac Officer stopped to help and was already holding C-Spine and a passerby had already put a gauze pack on her arm. I held her arm, which had stopped bleeding, and continued to talk to Bobbi until the ambulance arrived. And then I asked the question, “So Bobbi were you wearing your seatbelt?” She looked at me and said,”You know I was Sandy I’ve been in S.A.F.E.” I then asked her if she is glad that she had it on and she said “Oh Yes.” I followed the ambulance to the hospital and waited with Bobbi until her mom arrived. Mom told me Bobbi always wears her seatbelt and she makes sure that everybody else does too. I wanted to share this story with all of you and folks, this is what it’s all about. I have a story regarding a teen driver in town that was involved in a wreck. 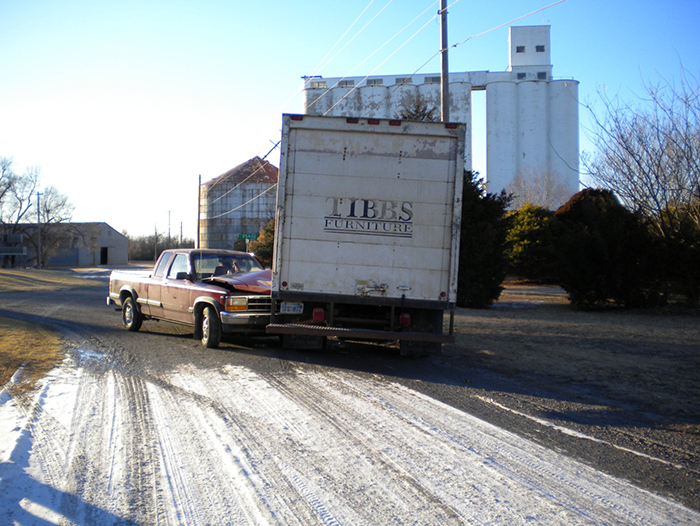 He failed to yield to the right of way within an intersection. The teen collided with a moving van. He was wearing his seatbelt and walked away with no injuries. His truck was totaled. 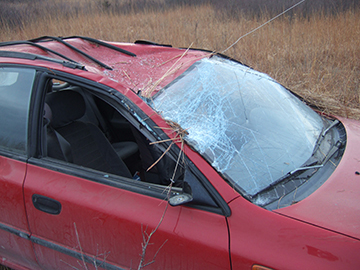 On December 9, 2010 I was dispatched to a rollover crash on Hwy 56 just west of Road G. When I arrived I saw a red vehicle on its wheels in south ditch. I went to the vehicle and made contact with the driver to make sure she was ok. There were several people around the car. The driver was a 17 yr old female and she said she was fine and she had her brother in the vehicle. He was in his car seat in the rear behind the driver seat. He had a bloody nose and he was in their mother's vehicle. Deputy Jim Baker arrived around the same time as I did and was helping get information about what happened. 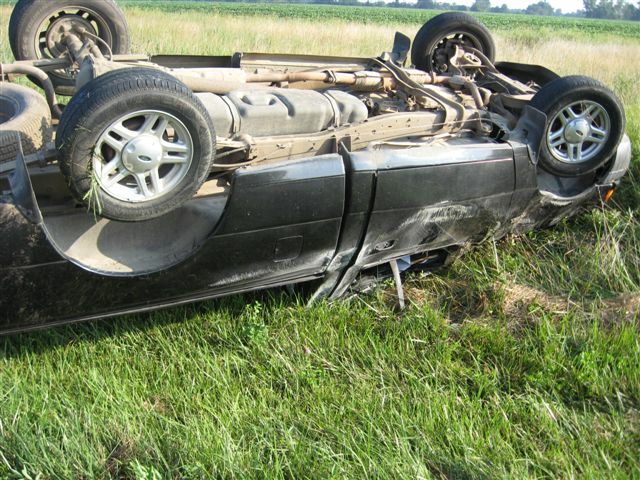 I called for an ambulance to come to the scene to have the two checked out because they had been in a rollover crash. I asked the driver what happened. She said the right tires had went off the road and when she turned to get them back on the road the car went across the center line she then over corrected, the car spun around and went into the ditch and rollover. After looking at the tire marks that is what I believed to have happened. I took photos of the crash scene. The EMT’s arrived and checked the two over. The mother decided to take the young boy to the doctor herself to get checked out and the driver went to school. 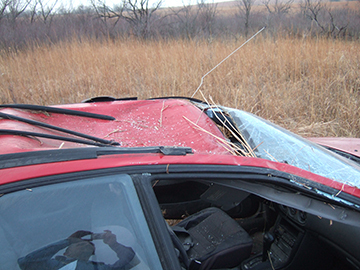 Flint Hills towing removed the vehicle and Montie Wheat was contacted about the barbwire fence that had been damaged do to the crash.